Total Workshop search results: 14. Displaying Page 1 of your woodworking search phrase FOLD DOWN DESK. Build a space-saving, wall mounted desk that folds up when not in use. The free plans are at the link. This is a link to a Google 3D SketchUp drawing for a computer cabinet with fold down drawer and concealed slide out keyboard tray. You will need the SketchUp software to download this drawing and its freely available online. We do not provide support for this software. Not all drawings have the measurements displayed but you can use the measurement tool in SketchUp to easily and accurately determine the dimensions of each lumber part. Most drawings do not have instructions, its assumed you can build it based on the completed drawing provided. Build this secretary desk which has great storage as well as a fold down top for your workspace. Here are free DIY step-by-step instructions. This desk features a fold down lid to make clean up a breeze. Here are the free woodworking plans. This is a link to a Google 3D SketchUp drawing for a fold-down desk, perfect for putting into a workshop, where space is limited. You will need the SketchUp software to download this drawing and its freely available online. We do not provide support for this software. Not all drawings have the measurements displayed but you can use the measurement tool in SketchUp to easily and accurately determine the dimensions of each lumber part. Most drawings do not have instructions, its assumed you can build it based on the completed drawing provided. At the link you can download the free plans to build this folding lap desk. Perfect for a breakfast tray as well. This compact computer desk is ideal for a room that is tight on space. When not in use, the keyboard slides back into its cubbyhole and the support doors fold in to close the cabinet and the desk leaf drops down. And it all comes out of a single sheet of plywood. Build this space-saving wall mounted drop down desk. Here are the free plans. 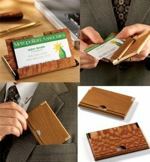 Thanks to its simple pinned hinge, this case props itself open for displaying cards on a desktop, and also folds shut into a slim tote for traveling in a suit-coat pocket. Completed, it measures just 3/8 × 2-3/4 × 4-1/4 and holds about 10 cards. We will show you how to make the wenge and lacewood card case, but you can use any combination of contrasting wood species, or even a single species. This easy-to-make desk is the perfect storage solution for a tiny office or playroom.